Through all of my years of sound healing, with crystal bowls, the voice, tuning forks, piano, harp and more, the one instrument I have consistently utilized have been the tingshaws. They are the ultimate healing tool that has been hidden in plain sight. People are so used to hearing and seeing them, that some of their magical and healing properties are overlooked. I am sharing this with you, because anyone that is doing either sound healing or meditation would be of great benefit to have a pair of this accessible musical instrument. Whereever I go, my tingshaws come with me in my healing kit. They are easy to travel with, fairly light in weight, and allow the rest of the sound healing tools to be able to work at maximum capacity. The tingshaws have two small metal gongs, connected with a leather strap. Most of them fit easily in the hand. Larger ones can be accessed, but the small ones are great for travel and work equally as well. The larger ones are usually practitioner tingshaws, for people who professionally do sound. But again, the smaller ones do the job.Traditionally, specifically in Tibet, Nepal and in Eastern Asia, they have been used to make music. However, they have also been used to clear negative energy from a space. What I have enjoyed about them probably the most is utilizing them in sound healing. I always start with one or three chimes at the beginning of a sound healing session. To allow for a person to clear blocks in the mind, body, emotions and spirit, the energetic body must be flailed open to allow a door for the negative chi to exit. The tingshaws do this beautifully without it being an abrasive sound. Just gently touching them together, either straight on, or at a slight angle, can allow the energetic body to be opened like a door, giving the negative chi a place to leave. It is subtle, but powerful, and is needed before doing deeper sound healing work. You can play the tingshaws literally around the body; near the head, feet, heart, wherever you are feeling pulled. However, if you play them near the head, it is important to not play them too loud. Sound is always louder for the person receiving than the person giving, but we will talk more about that in a bit. Besides for healing work, the tingshaws are also an excellent way to start a meditation practice, by allowing a person to bring the mind into the present moment. Hearing the clean, succinct sounds of the tingshaws brings focus. It still amazes me how such a small instrument can do so much good, but it really can. I keep mine by my altar. Even my husband has a pair by his altar! If you do not meditate or do sound healing, the tingshaws are still useful. You can walk around in each room, and click the tingshaws at least three times to clear negative energy from a space. This is definitely recommended for after a healing session as well, just to make sure the room does not accumulate with what other people let go of. It is not advised to use tingshaws after a sound healing session, for we do not want to reopen the energetic body. At the end of a session, this is when we want to seal the energetic body before someone gets in their car and drives away. We want the person to be grounded, sealed and integrated. Is it ok to play them in the middle of a sound healing session? You can if you choose. They can be an accent of deeper letting go during a session, particularly if you feel like the person is needing an extra boost to release. If you are feeling inclined to play, but want to keep the sound soft, I encourage you to sing or hum softly while playing the tingshaws in the middle of a session. This will smooth out the ride for someone who needs the energy of the tingshaws, but perhaps may not be expecting to hear that sound again. This clever ancient instrument is also wonderful for creating a deeper connection between a sound healing practitioner and the person receiving. Most people recognize that the sound creates a portal. The tingshaws create focus, and a poignancy of, “Aloha, I am here with you now. Let us begin.” The more connection we have with a person who comes to us for healing, the more care and heart they will feel from us, and the more they will open, feel trust, and let go. Sound is such an intimate way to connect with someone. We bypass the words, and a single “ching” of the tingshaws can be like handing someone a beautiful flower. No words are needed, but the energy coming through the gesture and literally through the sound can bring such a sense of peace, contentment, and ultimately a soft joy. Spiritually, I have seen people open their third eye when they hear the tingshaws. Sometimes people will have almost an etheric cloth over the third eye as protection. It is kind of like having many layers of drapes over the window. The light is still there, but it is hard to see because of all of the layers. The layers can be a form of protection from people who have had clairvoyant experiences, and it created fear. It was too much. The tingshaws can help the person start to let go of the layers that may be holding them back from experiencing more of their gnostic or nonphysical senses. The more we experience clairvoyance, clairaudience and our inner knowing, the more we can let go of suffering and embrace joy. The tingshaws can be a gentle way of supporting someone spiritually evolving. Solets talk about how loudly to play the tingshaws. For all of the purposes we have mentioned, it is better to play them softly than loudly. They can have too piercing a quality if played too loudly. I would recommend between 30 and 40 decibels, so more than a whisper, but not a loud voice. Kind of a gentle, quiet musical tone would be best. If they accidentally touch loudly, do not worry about it. Sometimes a little louder than we are aiming for can inadvertently help someone release something that needed a little more digging to get to. Another thing I truly admire about the tingshaws is their simplistic elegance. 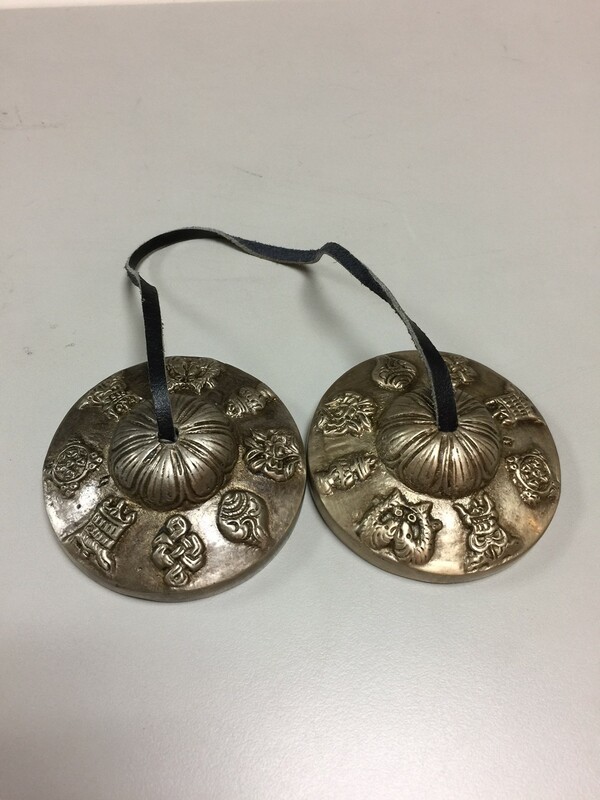 With two of these tiny gong shapes, they still have two different sounds. Sometimes you can hear the difference, if you have worked with them long enough, but regardless there are still 16 harmonic overtones that the human ear can hear, so those sounds are reverberating out towards the receiver’s ear. Each person will respond to the sound differently. The sound will not only open a door, but it will go where it is needed in the body. Often, the two sounds are so close in pitch to each other, that they will often sound like one sound, but the harmonic overtones will augment both of the tiny gong sounds. It will be fun for you to practice discerning what you hear. It is worth mentioning that I have seen people use the tingshaws to treat Tinnitus, almost like the vertical sounds of these circular brass instruments cancel out the incessant sound of the Tinnitus. Please remember, in general, it is best, if you do decide to utilize the tingshaws in the middle of a session, that you give yourself at least 20 seconds before chiming them together again. Allow the harmonic overtones to lap into the pond of the room. It is easy, out of enthusiasm, to play them more than what is actually helpful. Again, in a perfect world, I recommend them for the highest good at the beginning of a session. And if your heart is being pulled to play them in the midst of the session or concert, just give them space to work their magic.Thetingshaws are reasonably priced, elegant, and have a beautiful tone. I highly recommend adding this lovely instrument as a benevolent, positive tool that can build positive energy in your life. Our ancestors knew and understood the power of sound. In our busy lives, it would behoove us to take advantage of this easily accessible sound healing tool, and allow it to enhance our lives for the better. I encourage you to give a pair of tingshaws a try, and add a little more joy, magic and peace to your life. Thank you for taking the time for me to share my love of the tingshaws with you.